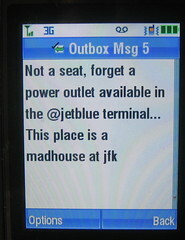 Last night I was scheduled to fly from New York’s JFK to Seattle on JetBlue. 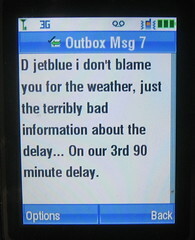 As the storm clouds gathered and a crazy thunderstorm gathered over the NY region I called JetBlue’s automated flight status service and was surprised to hear my flight was still on time. That was at 6:10pm. 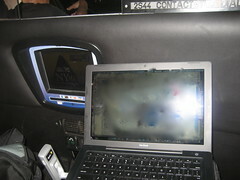 While in the cab on the way to JFK I went online to get some work done (you know, I can work from anywhere, but more on that later). 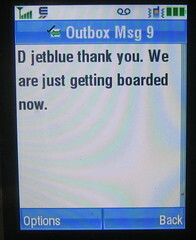 As we neared the airport I checked the JetBlue website. My flight was now delayed by an hour and twenty minutes. I got through security to find a terminal crowded with people, not a seat or outlet available anywhere. Folks sitting on the floor (hundreds of them). I wandered around hopelessly looking for a seat finally finding one near my gate. As 9:55 departure time approached, I went to the gate and over the cacophony of the crowed heard a barely comprehensible PA announcement: my flight was now delayed until 11:05. I still had some battery power left on the laptop, so i downloaded and watched the nightly news (thinking i had another battery fully charged). 11:05 rolls around and another announcement: Equipment still on the ground in atlantic city! 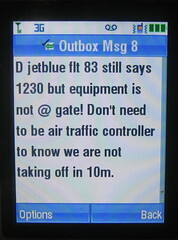 No departure until 12:30AM! 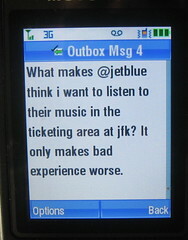 So now I started tweeting directly to JetBlue. 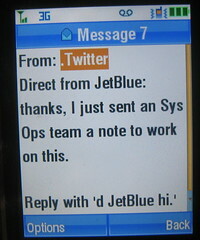 And JetBlue started responding. 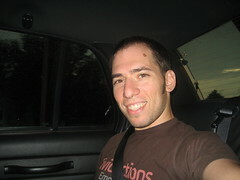 See the photos of my cell phone below. Back to my ability to work from anywhere: apparently for me crowded, loud airport terminals are not easy places for me to get work done when i keep expecting to be boarding my plane in 45 minutes to an hour. 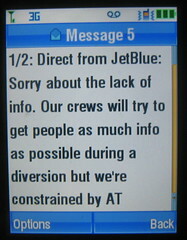 It was nice to be able to have this short dialog over twitter with someone at JetBlue, but would have been nicer if they had let everyone in the terminal know that the entire airport was shut down for a few hours due to the storms and that delays would likely be 3 to 5 hours. Then I might have waited 20 minutes for a seat at a bar or restaurant. Also, telling folks at the time they are supposed to be boarding that their plane is on the ground in another city and you are pushing back departure again is not really the best way to keep them happy. 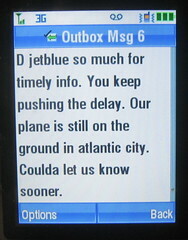 I would have rather been updated, you know, earlier that our plane had not even taken off from Atlantic City. One 4 and half hour delay is better than 30 ninety minute delays.